Who doesn’t love pizza? 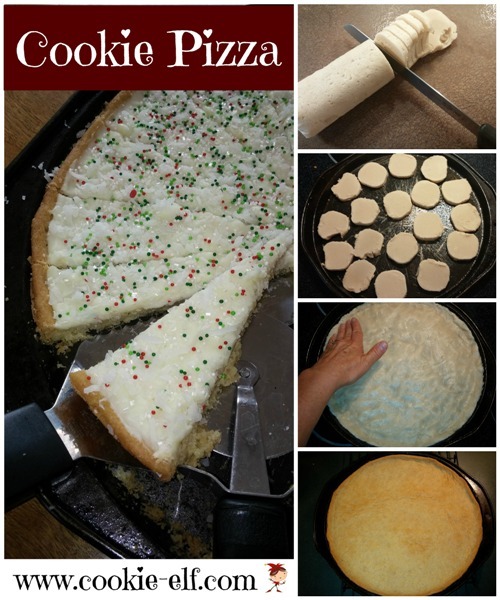 Cookie Pizza is a fun and easy holiday cookie recipe variation on the usual yeasty dough, red sauce, and cheese version. It is an especially good cookie recipe for kids to make because it is so versatile. Variations are endless. You can choose sprinkles or other decorations to suit your occasion or holiday. Preheat oven to 350º F. Prepare a 12-inch round pizza pan by greasing or spraying its bottom and sides with vegetable spray. Remove cookie dough roll from packaging and place it on a cutting surface. Use a serrated knife to cut dough into 1/4 inch thick slices. Arrange slices on the bottom of the pizza pan. Press cookie dough until it evenly covers the bottom and up ¼ inch sides of the pan. Bake the pizza for 15-20 minutes. Do not over bake. Remove pizza from the oven and allow it to cool completely. Place candy melts or candy coating in a microwave-safe dish. Microwave on high for 45-60 minutes, stirring once, until smooth. Remove from the microwave. Spread the “pizza sauce” candy coating onto the pizza. Sprinkle pizza with “toppings” – sprinkles, candy pieces, or colored sugar. Allow coating to harden, about 30 minutes. Use a pizza wheel or a serrated knife to cut pizza into wedges. Remove pizza wedges from the pan with a metal spatula. Store wedges loosely covered at room temperature. 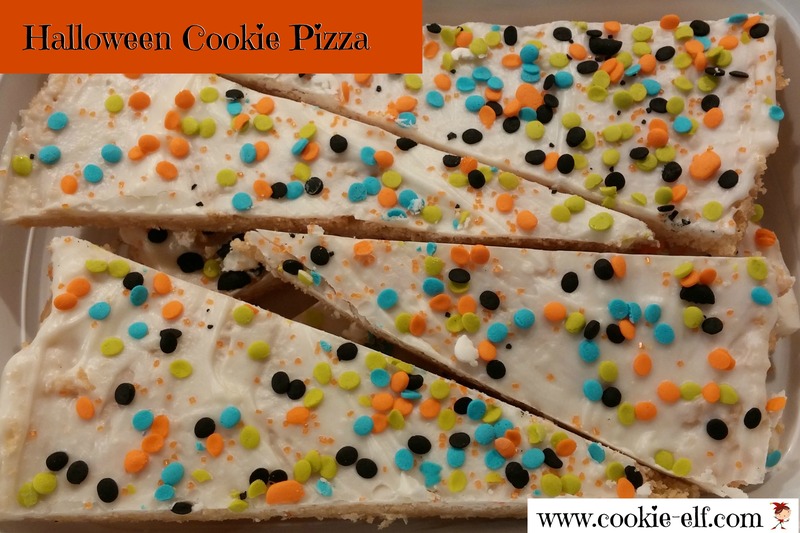 Halloween Cookie Pizza: Sprinkle candy corn, peanut butter-flavored candy pieces, and raisins onto the pizza. Christmas Cookie Pizza: Sprinkle red and green candy-coated milk chocolate candies onto the pizza. Sprinkles with white crystal sugar. Valentine Pizza: Sprinkle red, pink, and white candy-coated milk chocolate candies onto the pizza. Easter Pizza: Sprinkle shredded coconut and jelly beans onto the pizza. You can substitute your favorite sugar cookie recipe (here’s one) for the refrigerated cookie dough. Do not over bake the cookie base or pizza wedges will be crisp and difficult to remove from the pan. You can substitute vanilla candy melts with any flavor to vary the pizza “sauce.” Or you may choose to use vanilla but add 2-3 drops of gel food coloring to tint the “sauce” to suit the occasion. Melt the candy coating completely before adding food coloring. Be sure to use an oil-based or powdered-base food coloring (not water-based).